Resizing an image will change the image data on every layer in your page. If you want to change just a single layer use the various filters from the Distort category of filters. Resizing is different from Adjusting the Page Size. When you resize an image you are changing the image data and the page size where as when you adjust a page size the image data is not changed just the page size is changed. 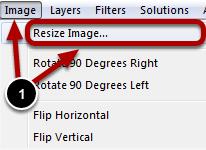 Select Resize Image from the Image menu. This is the current size of your image in pixels. 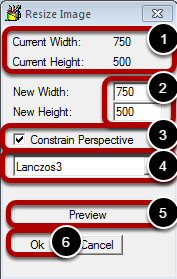 The Constrain Perspective option, when enabled, will keep the aspect ratio the same. If you want to distort your image this option can be unchecked. The resizing method to use. The default, Lanczos 3, will almost always give the best results. Click the Preview button to see the result prior to making them final. Click OK to preform the resize.